EUDORA is a jewelry brand from 2009 and was registered in America. We have 3 specialty stores in HongKong and Mexico. All the jewellery in Eudora Harmonyshop is designed and manufactured by our designer team and professional factory, so we can provide customized processing services for wholesale clients. Our main products are high quality Eudora Harmony Balls, silver series, aromatherapy diffuser necklaces, bracelets and rings. All products at our store have passed SGS Test (SafeGuardS). Choosing us is to choose health and beauty. Eudora Aroma is not only a jewelry, but also is a mini diffuser. * Silver Plated Copper Pendant can make sure the jewelry will never sensitization and change color.Safe and fashion. * The cage also can be a Eudora Harmony Bola cages to enjoy the crispy wind chimes. All-purpose and suited. 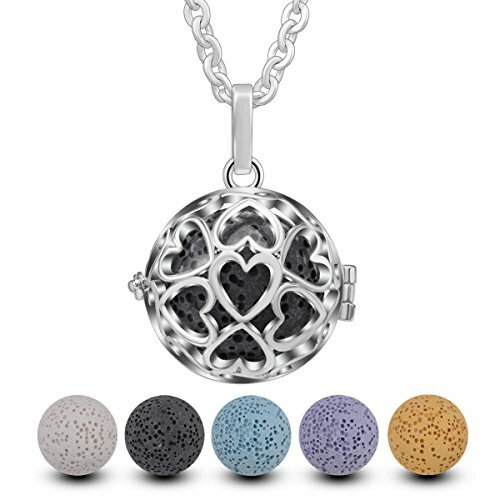 * Enjoy essential oils and the benefits of aromatherapy by wearing your aromatherapy diffuser locket around your neck. Very suitable to be a gift for mothers, wife, friends, etc. Why you need a perfume necklace? * Increase body circulation, reduce fatigue, help maintain respiratory skills. * Mediation body function, relieve mental pressure, promote vigor, improve work efficiency. * Strengthen resistance, prevent disease and reduce high blood pressure. * Improve the respiratory tract, nasal allergies and asthma. * Make you relaxed, promote appetite, stimulate human potential immunity. * As a sleep aid, such as using lavender essential oil. * Banish mosquit and acarid, such as camomile essential oil. MADE OF SILVER PLATED COPPER FOR BETTER DURABILITY AND HYPOALLERGENIC - high quality material and clasp is very reinforced to ensure durability. COMES WITH 5PCS(Random Color) UNIQUE MIXED COLOR LAVE ROCK STONE BEADS--stones of protection, strength and fertility. Helps to dispels anger, strengthens our relationship, cements our beliefs and provides guidance, clarity and hope in difficult times. AROMATHERAPY ANYTIME YOU WANT AND ANYWHERE YOU GO - Diffuse your essential oils at work, at home, at your friend's place or anywhere. This locket is easy to open and easy to close. DELICATE filigree design pendant is 18MM/0.70" (internal diameter). Lead, nickel, and cadmium free. The chain has a lobster claw clasp for extra durability and is 24 inches long. PERFECT GIFT SET FOR ESSENTIAL OIL LOVERS - Well-packed with EUDORA Logo gift box, nice for gifting or treat yourself.